HERMES - Bureau Veritas from MAG FILM on Vimeo. Aerial Cameraman MAG from www.drone-op.com flies through Port of Rotterdam. It’s not everyday that we get asked to do some tight work. But when we do, wow do we get excited. 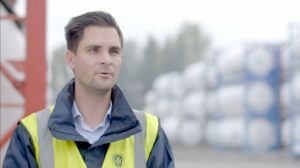 When the call came in to shoot a corporate promo for new app at the Port of Rotterdam’s shipping container yard, we couldn’t believe our luck. When we saw they had a forklift the size of a four story building, well that just made the little boy in us all whoop for joy. Seriously it was like watching Godzilla stomp through Tokyo. Our aerial camera brief was to capture GV’s of the yard (Easy! ), follow the monstrous fork lift (No problem!) and…. fly through the canyons of containers following the inspectors (Gulp!). Never one to sidestep a challenge we successfully navigated the towering steel maze without a hitch and left the client dazzled by our skill and more importantly the quality of our images. Complete Corporate Video Production Services. Ground & Aerial Camerawork. We also shot all of the ground footage on our Sony FS7 4k camera and DJI Osmo+, including user testimonials and a product overview for further marketing purposes. Furthermore if you need the whole package of ground based production we do that too. Visit www.magshoots.com | www.mabinogi.co.uk for more info. We are always happy to work out package deals to suit any and all budgets. So drop us a line today and let’s start shooting!